How many times has that thought crossed your mind in the last month? This week? So far today? The average CEO or Deputy Minister spends about 17 hours each week in meetings. Senior Executives spend an average of 23 hours a week in meetings. Middle managers often spend 11 or more hours a week in meetings. 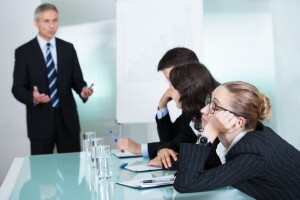 Senior and middle managers said that only 56% of meetings they attended were productive. Do you see yourself or your organization in any of those bad practices? Diane K., in her PMC workshop on Effective Meeting Strategies, offers these simple strategies for productive meetings. 1. Start with the end in mind! What is the purpose of the meeting? Is it to share information? Update on a project? Discuss a problem? Announce a major change? Make a decision? Articulate the purpose. 2. Do you need to meet? Too often, formal meetings are organized when an email, a phone call, or even a five-minute stand up discussion would have met the need. Before scheduling a meeting, ask yourself if there is a better way to satisfy all or part of the need. Face-to-face meetings are valuable, but they consume much time and money. Spend your face-time carefully. 3. If you must meet in person, create a realistic agenda. Meeting planners are often too optimistic. They create densely packed agendas that leave no wiggle room for unforeseen discussions or speakers who go long. Start with your major blocks of time and then, as Diane says, “do the math.” In a discussion, a participant might easily speak for one to four minutes. If you expect a healthy discussion and you have ten people, do the math: ten people times four minutes gives you 40 minutes. For a quick vote you might only need 10 to 15 minutes. For an important issue, give people time to discuss and explore. People who don’t feel they’ve been heard may leave your meeting frustrated and skeptical about the entire process. If you don’t have time for a thorough discussion with the full group, consider alternatives like smaller breakout discussions. Design a realistic agenda that will give you the time to deal with the important issues. Set yourself up to succeed. 4. Invite the right people. Your participants are the meeting. You don’t just want to fill the seats. You want a room full of engaged people. You will need people who can address issues, answer questions and make decisions. Look at the agenda and decide if you need all of those people in the room for the duration. Would it make more sense to have some people attend just part of the meeting, to participate remotely, or to be on call? If they see that you take their time seriously, they’ll probably be more engaged and appreciative. Meetings are rarely the beginning or the end of a process. They’re essential links between the past that brought these people together and the future they want to create. The stakes are high. Think of the cost to your organization of bringing all of those people together. Think of the value of their time. Think of the end result. Instead of dwelling on meeting failures, think about what success – a meeting that gets the job done – can look like, and what it could mean. For you. For your clients. For your community. If you would like to receive more practical tips and strategies to achieve results, register for one of Diane’s upcoming Effective Meeting Strategies workshops. Most people think much of the time they spend in meetings is wasted. Have you ever wondered what you might achieve if you could become one or two or five percent more effective – as a participant or an organizer – at meetings? “Students of meetings have reduced everything that can be said into questions, answers, positive reactions, and negative reactions. Questions can only seek, and answers only supply, three types of responses: information, opinion, and suggestion.” This Harvard Business Review article argues that “it is the suggestions that contain the seeds of future success.” It offers tools to help you identify and cultivate those seeds of success at your next meeting. Businesses lose billions each year because of unproductive meetings. Here are 8 elements to help you avoid wasting time and money during remote meetings.